Analyzing all the genes of dozens of people suffering from a rare form of hypertension, Yale University researchers have discovered a new mechanism that regulates the blood pressure of all humans. The findings by an international research team headed by Yale scientists, published online on January 22, 2012 in the journal Nature, may help explain what goes wrong in the one billion people who suffer from high blood pressure. The study also demonstrates the power of new DNA sequencing methods to find previously unknown disease-causing genes. The team used a technique called whole exome sequencing — an analysis of the makeup of all the genes — to study a rare inherited form of hypertension characterized by excess levels of potassium in the blood. They found mutations in either of two genes that caused the disease in affected members of 41 families suffering from the condition. The two genes interact with one another in a complex that targets other proteins for degradation, and they orchestrate the balance between salt reabsorption and potassium secretion in the kidney. "These genes were not previously suspected to play a role in blood pressure regulation, but if they are lost, the kidney can't put the brakes on salt reabsorption, resulting in hypertension," said Dr. Richard Lifton, Sterling Professor and chair of the Department of Genetics at Yale and senior author of the paper. The mutations had previously been difficult to find because there were very few affected members in each family, so traditional methods to map the genes' locations had been ineffective. "The mutations in one gene were almost all new mutations found in affected patients but not their parents, while mutations in the other gene could be either dominant or recessive. The exome sequencing technology was ideally suited to cutting through these complexities," said Dr.
Over many generations, people living in the high-altitude regions of the Andes or on the Tibetan Plateau have adapted to life in low-oxygen conditions. Living with such a distinct and powerful selective pressure has made these populations a textbook example of evolution in action, but exactly how their genes convey a survival advantage remains an open question. 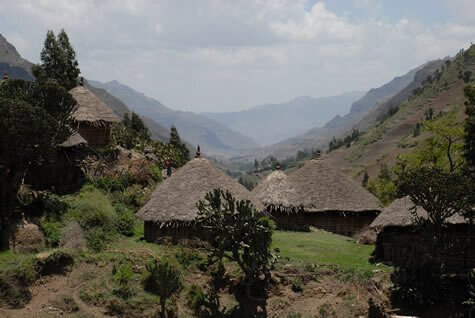 Now, a University of Pennsylvania team has made new inroads to answering this question with the first genome-wide study of high-altitude adaptations within the third major population to possess them: the Amhara people of the Ethiopian Highlands. Surprisingly, all three groups’ adaptations appear to involve different genetic mutations, an example of convergent evolution. “These three groups took different genetic approaches to solving the same problem,” said senior author Dr. Sarah Tishkoff, a Penn Integrates Knowledge professor with appointments in the genetics department in Penn’s Perelman School of Medicine and the biology department in the School of Arts and Sciences. In addition to Dr. Tishkoff, the research was led by Dr. Laura B. Scheinfeldt, a research scientist in the genetics department at the Perelman School of Medicine. Other members of the genetics department who contributed to the research are Drs. Sameer Soi, Simon Thompson, Alessia Ranciaro, William Beggs, Charla Lambert, and Joseph P. Jarvis. The Penn team collaborated with Drs. Dawit Wolde Meskel, Dawit Abate, and Gurja Belay of the Department of Biology of Addis Ababa University. Their research was published on January 20, 2012 in the journal Genome Biology. One of the guiding principles behind evolution is natural selection; the more an organism is suited to its environment, the more likely it is to survive and pass on its genes. Minuscule amounts of ethanol, the type of alcohol found in alcoholic beverages, can more than double the life span of a tiny worm known as Caenorhabditis elegans, which is used frequently as a model in aging studies, UCLA biochemists report. The scientists said they find their discovery difficult to explain. "This finding floored us — it's shocking," said Dr. Steven Clarke, a UCLA professor of chemistry and biochemistry and the senior author of the study, published January 18, 2012 in the online journal PLoS ONE. In humans, alcohol consumption is generally harmful, Dr. Clarke said, and if the worms are given much higher concentrations of ethanol, they experience harmful neurological effects and die, other research has shown. "We used far lower levels, where it may be beneficial," said Dr. Clarke, who studies the biochemistry of aging. The worms, which grow from an egg to an adult in just a few days, are found throughout the world in soil, where they eat bacteria. Dr. Clarke's research team — Paola Castro, Dr. Shilpi Khare, and Dr. Brian Young — studied thousands of these worms during the first hours of their lives, while they were still in a larval stage. The worms normally live for about 15 days and can survive with nothing to eat for roughly 10 to 12 days. "Our finding is that tiny amounts of ethanol can make them survive 20 to 40 days," Dr. Clarke said. Initially, Dr. Clarke's laboratory intended to test the effect of cholesterol on the worms. "Cholesterol is crucial for humans," Dr. Clarke said. "We need it in our membranes, but it can be dangerous in our bloodstream." The scientists fed the worms cholesterol, and the worms lived longer, apparently due to the cholesterol. They had dissolved the cholesterol in ethanol, often used as a solvent, which they diluted 1,000-fold. A team of researchers led by Dr. Kasturi Haldar and Dr. Souvik Bhattacharjee of the University of Notre Dame's Center for Rare and Neglected Diseases has made a fundamental discovery in understanding how malaria parasites cause deadly disease. The researchers show how parasites target proteins to the surface of the red blood cell that enables sticking to and blocking blood vessels. Strategies that prevent this host-targeting process will block disease. The research findings appear in the January 20, 2012 edition of the journal Cell. The study was supported by the National Institutes of Health. Malaria is a blood disease that kills nearly 1 million people each year. It is caused by a parasite that infects red cells in the blood. Once inside the cell, the parasite exports proteins beyond its own plasma membrane border into the blood cell. These proteins function as adhesins that help the infected red blood cells stick to the walls of blood vessels in the brain and cause cerebral malaria, a deadly form of the disease that kills over half a million children each year. In all cells, proteins are made in a specialized cell compartment called the endoplasmic reticulum (ER) from where they are delivered to other parts of the cell. Dr. Haldar and Dr. Bhattacharjee and collaborators Dr. Robert Stahelin at the Indiana University School of Medicine- South Bend (who also is an adjunct faculty member in Notre Dame's Department of Chemistry and Biochemistry), and Drs. David and Kaye Speicher at the University of Pennsylvania's Wistar Institute discovered that for host-targeted malaria proteins the very first step is binding to the lipid phosphatidylinositol 3-phosphate, PI(3)P, in the ER. This was surprising for two reasons.